Pieter Brueghel the Elder (1526/30–1569), The Triumph of Death (c 1562), oil on panel, 117 x 162 cm, Prado National Museum, Madrid, Spain. Wikimedia Commons. Imagine for a moment what it would be like if half of all the people that you know were to suddenly fall ill and die within a fortnight. For most of us, that’s so far beyond experience that we can only fall back on apocalyptic science fiction and horror movies. 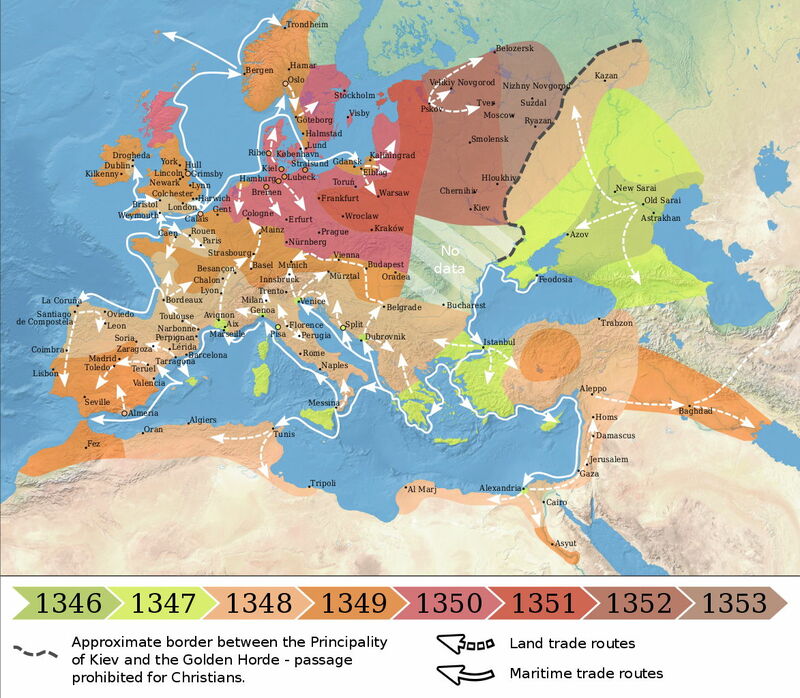 Just as Europe was starting to emerge from the Middle Ages and the Renaissance was developing across the continent, in the middle of the fourteenth century, it was struck by catastrophe which almost led to the extinction of humans from the area: the Black Death. By early 1438, for instance, the city of Florence in central Italy was becoming prosperous and its population had grown to more than a hundred thousand. Then in the Spring of that year, over a period of just a few weeks, the Black Death killed about half of those people. Many of the survivors were scattered over the surrounding countryside, praying that they would be spared, and scared to return to the city. One of the survivors – who may have sheltered away from Florence itself – was a twenty-five year-old scholar and writer, Giovanni Boccaccio. Years later, he was to describe the coming of the Black Death to Florence in the opening of his famous collection of short stories The Decameron (c 1353). The epidemic forms the frame story which drives its ten young people and their servants to seek refuge outside the city, and to tell one another the hundred tales which make up the bulk of Boccaccio’s book. In this article and the next, I look at paintings which depict the Black Death, and related plagues, in Europe, and their human impact. This is to set the scene for a new series in which I will look at paintings of the stories in Boccaccio’s Decameron. It also coincides with the centenary of an even greater human catastrophe, the influenza pandemic of 1918. Epidemics of infectious diseases had been a feature of cities, and concentrations of people in armies, since the dawn of ‘civilisation’. 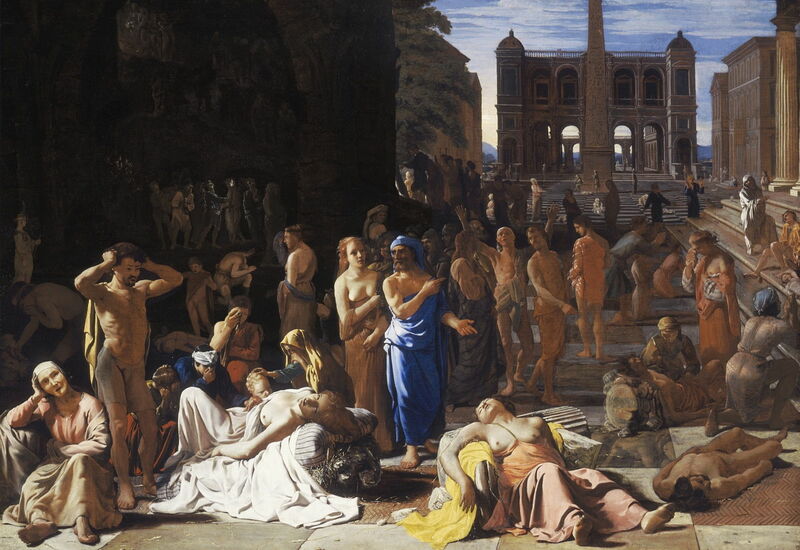 In classical times, both Athens and Rome were struck by epidemics of what is likely to have been bubonic plague. Michiel Sweerts’ painting of Plague in an Ancient City from about 1652-54 is believed to show Athens during one of these epidemics. The moribund and the dead litter the streets, normal life having collapsed. The pandemic which started in about 1338 was different, though. Changing climate in the grasslands of Asia led to the movement of rodent populations into cities, and those rodents brought with them fleas which carried diseases which were highly infectious among humans, notably Yersinia pestis, which causes bubonic plague. O.J. Benedictow and Flappiefh, Origin and Spread of the Black Death in Europe between 1346 and 1353. Wikimedia Commons. In around 1346, outbreaks had reached south-west Asia, and were soon affecting the Ukraine, from where they spread with maritime traders. 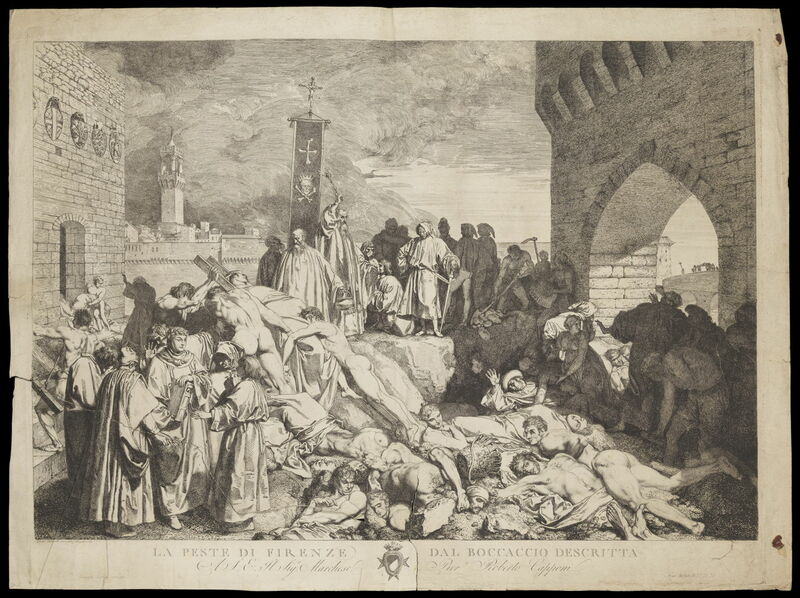 They brought the plague to ports such as Venice and Genoa, from where it moved inland until striking Florence, Rome and Naples. It then spread north to affect most of the continent and its islands by 1349. Luigi Sabatelli (1772-1850), The Plague of Florence in 1348 (date not known), engraving after original work by Sabatelli, illustration to an edition of Boccaccio’s Decameron, The Wellcome Collection, London. Courtesy of The Wellcome Foundation, London, via Wikimedia Commons. Doubt has been cast that Boccaccio’s description of the Black Death in Florence was based on his personal experience, but few alive at the time could have escaped witnessing its deadly consequences. Much later, in the early nineteenth century, Luigi Sabatelli made this engraving to illustrate an edition of the Decameron, in The Plague of Florence in 1348 (date not known). 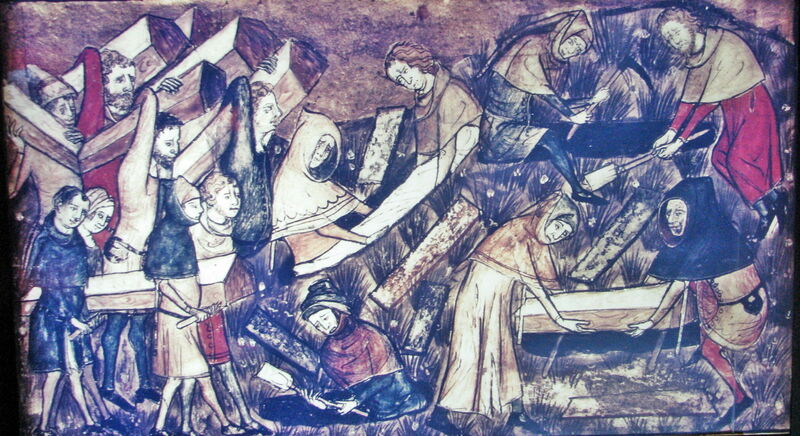 Artist not known, Citizens of Tournai Burying Their Dead During the Black Death (c 1350), miniature from manuscript, details not known, The Diaspora Museum, Tel Aviv, Israel. Image by Sodabottle, via Wikimedia Commons. Contemporary depictions give some idea of the high death rates, and the problems of disposing of bodies. This miniature of Citizens of Tournai Burying Their Dead During the Black Death shows the scene in Belgium. 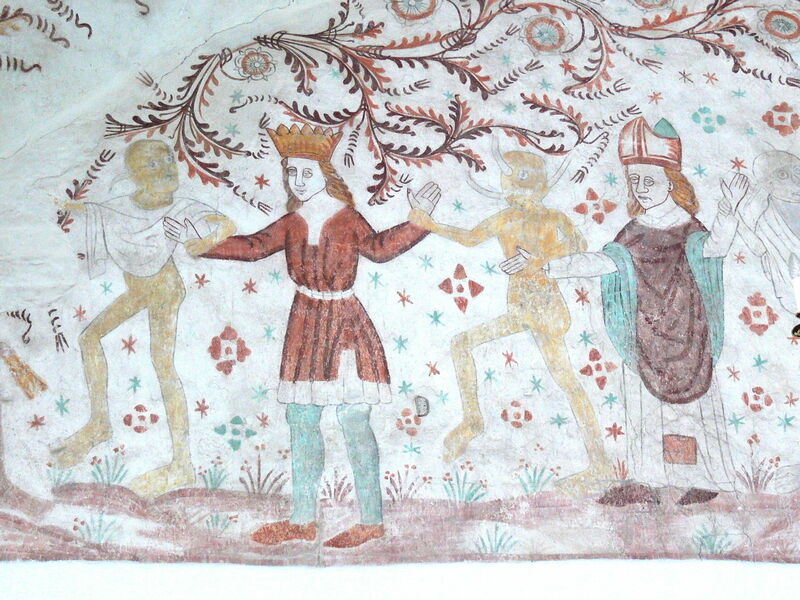 The Master of Elmelunde (fl 1350), Danse Macabre (Dance of Death) (detail) (c 1350), fresco, dimensions not known, Nørre Alslev Church, Falster, Denmark. Image by Wolfgang Sauber, via Wikimedia Commons. Some remarkable frescoes in Nørre Alslev Church, on the island of Falster in Denmark, which date from around the time of the Black Death, show what became known as the Danse Macabre or Dance of Death. Martin Schaffner (1478–1548), Plague Altarpiece formerly in Augustinian Monastery, Ulm (c 1513-14), fir, 167.8 x 49.8 cm, Germanisches Nationalmuseum, Nuremberg, Bavaria, Germany. Image by anagoria, via Wikimedia Commons. Plague Altarpieces appeared in some churches in an effort to ward off future epidemics. 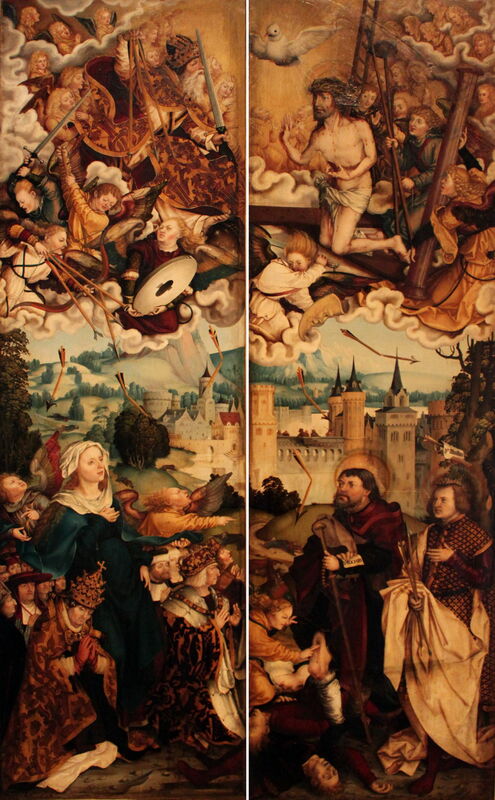 Here two panels from about 1513-14 by Martin Schaffner show victims seeking divine intervention. The cloaked figure of a saint in the right panel is Saint Roch, with his wounded thigh, and to the right of him is Saint Sebastian. Opposite them is the figure of the Virgin Mary, dressed in blue. Above them, angels of death are picking off people at random using their crooked arrows, in punishment for their sins. Master of the Biberach Holy Kinship (fl. 1520), Workshop of, The Last Judgement (c 1520), polychrome predella on limewood, 55 x 172 cm, Musée des Beaux-Arts, Lyon, France. Wikimedia Commons. This magnificent polychrome limewood sculpture shows The Last Judgement (c 1520) as an outbreak of plague, and may be based on descriptions of the Black Death. Pieter Brueghel the Elder’s apocalyptic vision of The Triumph of Death from about 1562 combines scenes of a plague epidemic with the nightmare images first developed by Hieronymous Bosch in the early 1500s. 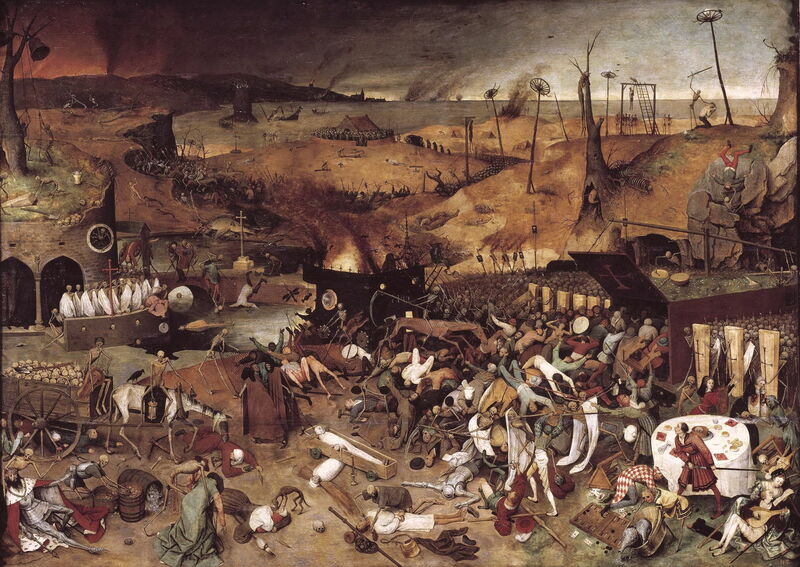 Bosch was born after the Black Death had swept through the Low Countries, but Brueghel may well have witnessed a subsequent outbreak of bubonic plague. 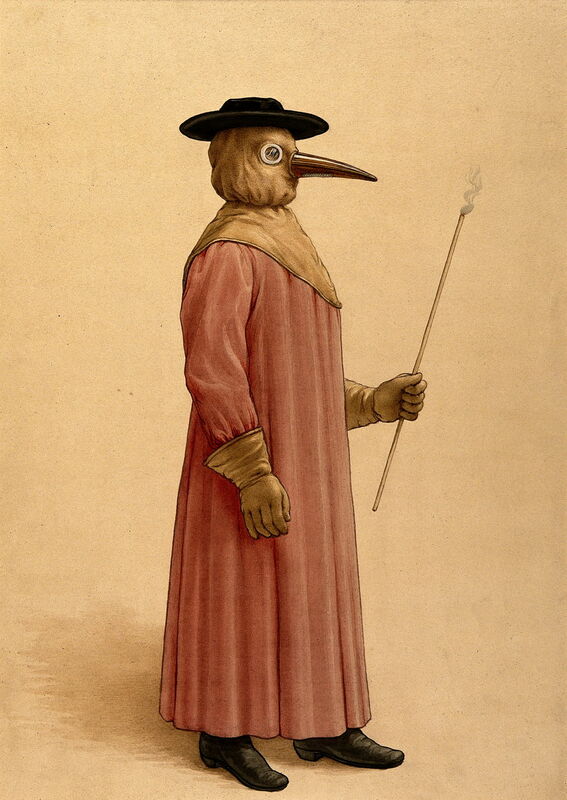 Artist not known, A Physician Wearing a Seventeenth Century Plague Preventive Costume (seventeenth century), further details not known, The Wellcome Collection, London. Courtesy of The Wellcome Foundation, London, via Wikimedia Commons. Venice suffered repeatedly, with more than twenty further outbreaks of plague in the city over the two centuries after the Black Death. In those later outbreaks, doctors and others diagnosing and managing victims adopted characteristic dress, shown here in a seventeenth century illustration. The bird-like mask was adopted as a reminder of those dark days, worn in masked balls ever since. One characteristic of many of the paintings made of the Black Death was the role of saintly figures in giving comfort to the dying, and perhaps even relief from the epidemic, as shown in the paintings in tomorrow’s concluding article. Posted in General, Life, Painting and tagged Boccaccio, Brueghel, painting, renaissance, Sabatelli, Schaffner, Sweerts. Bookmark the permalink.